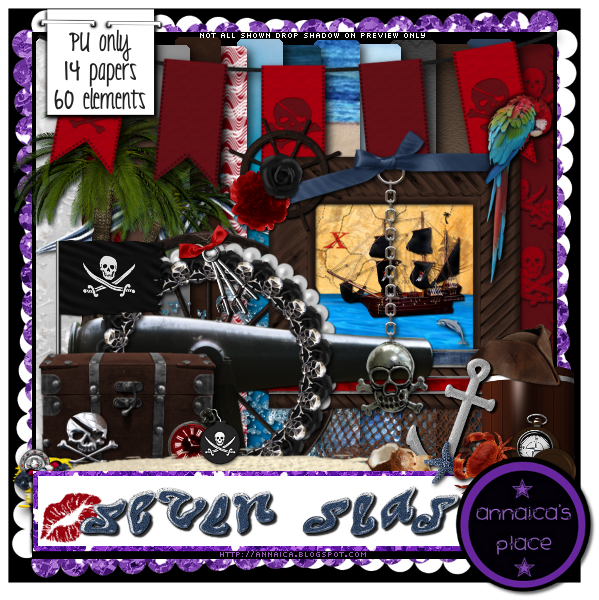 Here is my new tagger kit, Seven Seas. It is now available at both stores I sell my products at (HERE or HERE)! In this kit, there are 14 papers, and 60 elements! It has everything you'd find sailing the seven seas. There's a pirate ship, a canon, flags, treasure chest with gold and coins and jewels, a map, a parrot, several skulls and bones, 6 bows/ribbons, 3 flowers, palm tree and island plants, water and sand, shells and other sea life, 4 frames and 2 word arts included!